SAW032176 SCOTLAND (1950). 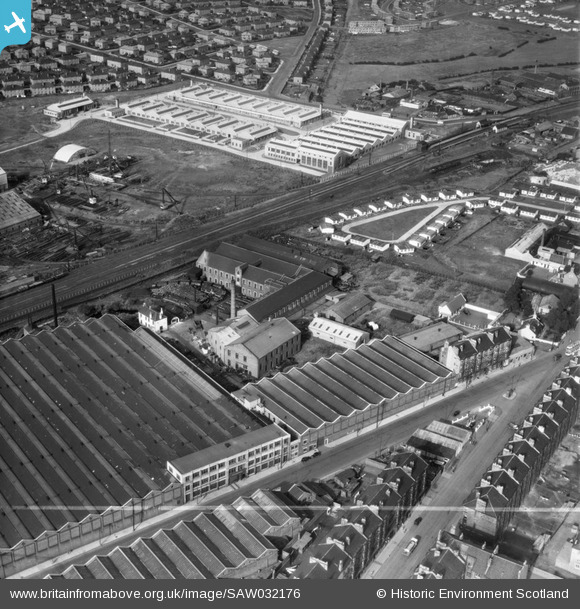 Glasgow, general view, showing British Dyewood Co. Ltd. Carntyne Dyewood Mills, Shettleston Road and Carntyne Station. An oblique aerial photograph taken facing north-east. This image has been produced from a crop marked negative. Title [SAW032176] Glasgow, general view, showing British Dyewood Co. Ltd. Carntyne Dyewood Mills, Shettleston Road and Carntyne Station. An oblique aerial photograph taken facing north-east. This image has been produced from a crop marked negative. Next stop up the line Shettleston station. Steam Hammer sculpture taken from "The Forge" on Shettleston Road. This photo appeared in "The Engineer" magazine, dated August 13, 1920 and shows a new Beardmore 2-8-0 steam locomotive for the East Indian Railway. A tank built by William Beardmore & Co during the First World War. Beardmore had become a major warship builder and naval armaments manufacturer before the war, and the range of weapons and munitions produced at the firm's vast Parkhead Forge expanded rapidly after 1914. Among other things, the company built fifty tanks. The pedrail shoes (the treads) for the tanks were manufactured at Parkhead and the rest of the work was completed at the firm's Dalmuir works. Roundabout here seems to be Parkhead Jnrs. original ground.The club was founded in 1880 and was sometimes referred to as Parkhead Football Club. Their first ground was at the Sheddens where Old Shettleston Road and Shettleston Road meet. From there they moved to Powfoot Street/Beattock Street and their ground was known as Helenslea Park, although they were known to have played some games at Helenvale Park. They were five times winners of the Scottish Junior Cup in 1899, 1903, 1915, 1920 and 1924 as well as being runner-up on four other occasions. They were at one time the oldest team in the Scottish Junior League. Their third and final ground was once again named Helenslea Park and was located at Cuthelton Street. The club became defunct in 1964. Wheel and axle works of William Beardmore & Co.
this is Bills shop,my sister used to get "tick" from him!